While at Lifefest recently I had the chance to sample Dove Chocolate and well feel in love with the Dusk flavor! Just last week I got an email telling me that Dove was looking for 300 Canadian women who are active on the net ie bloggers to give a mountain full of chocolate for them to share! Well today FedEx delivered a big box of yummy chocolate as well as a few freebies: a great size tote bag that will be great for trips to the library, a wine glass that I promptly filled with Dark and Milk Chocolate and gave it to my upstairs neighbour, a pedicure pamper kit, and oddles of chocolate! I receive 20 purse packs to share with friends, as well as 4 tablet bars and 3 cartons of the bite size chocolate. Tomorrow all of Roo’s teachers and EA’s are getting a chocolate care package. The rest will go to some of my girlfriends. Don’t you wish you lived close by? Now if you live in Toronto, Vancouver or Montreal they are still looking for women between the ages of 25-45 who want to sample and share. Follow this link to get the details! Butter eight 4-ounce individual ramekins and set aside. Over a double boiler, melt the chocolate and the butter. Keep it hot. In the bowl of a standing electric mixer fitted with the whip attachment, add the eggs and sugar, and begin to whip the mixture on medium speed. Beat for 2 to 3 minutes, just until it turns lemony yellow (not pale or white). Meanwhile, whisk the all-purpose flour into the hot chocolate mixture. Add the hot chocolate mixture all at once to the mixing bowl containing the egg and sugar mixture, and whisk for 1 minute. Remove from the machine and scrape down the sides of the bowl. Divide evenly among the containers filling up just to the top. Place on a baking pan. Bake for 5 minutes. Turn the pan one-half turn and continue baking for 3 to 4 minutes more. The cakes will be firm on the outside rim and erupting in the center. Lightly dust with confectioner’s sugar and serve immediately. Well I am where it is right before check day at the beginning of the week so you will see some menus that have me digging into my food storage pantry. I think digging into food storage should be part of our routine. So what ingredients are from the pantry: TVP, oatmeal, Kraft dinner, peanut butter, tuna,dried mango, pasta, pasta sauce and Kool Aid. These are all things that do get used on a regular basis here in this house so it was important to have them as part of my food storage. The oatmeal will be used for breakfasts along with the Rice Krispies and Cheerios that are already in the cupboard. So will the PB for toast. Kool Aid will be for an afterschool drink with Roo taking water for her lunches. Her lunches this week are a pizza lunch that the class won, chicken noodle soup, mini ravoli, ham and cheese sandwich and a grilled cheese. These will have some fresh fruit or dried mango added to them. BROWN beef; drain. Add mashed potatoes and seasoning mix; mix well. FILL taco shells with beef mixture. Top with lettuce, tomato, green onions, cheese and taco sauce. Well I am off now to read what is cooking for everyone else over at Laura’s! Some of my readers know this fact about me: I volunteer at the Salvation Army Food Bank twice a week. Yesterday the main depot that maintains our supply of food had a huge fire. Four million in food, clothing and toys are gone! These supplies would of been to help families in need in the GTA. There is an immediate need of FOOD…but where should you take it too. Your local depot is in need this week especially. You can find the one closest to you by checking out 211Toronto. Follow the links under foodbanks. If you are one of my far away readers and you are moved to help you can donate through the main Salvation Army site. Right now the need is for getting food to the local depots. Well here it is Monday again and time for me to plan my menu but wait..what has changed from last week. I have decided that I am tired of being the fat cheap momma. I am now the frugal healthy melting momma. I am using the Isagenixprogram to help me melt. So two of my meals a day are meal replaced with yummy chocolate shakes. Yes they do taste good! With that said I am replacing breakfast and lunch with them and having a healthy dinner with Roo while still watching my budget…after all my cheap, um frugal habits arent going anywhere. Roo is taking the Isakids multi Vitamin and getting a well balanced diet after all she is ten. Cereal( Rice Krispes, MultiGrain Cherrios or Corn Flakes), eggs, wholewheat toast, orange juice and maybe whole grain pancakes on Saturday. Fresh fruit: mango, strawberries, apples, and grapes are in the house. For lunch ( she eats at school)- bagels, wholewheat rolls, cooked ham, turkey meat,chicken, cheese, yogurt tubes, salad fixings, and serving size pudding or fruit cups are in the house. As well chicken noodle soup or pasta are available too. Monday-Grilled chicken breast salad–making this with spinach leaves, chicken breast( sale item), tomatoes, Parmesan cheese, a 1/2 cup of croutons and a low fat dressing….lucky for me Roo loves salad! Now if you want to follow my journey as I melt you can read me over at Life and Times of a Melting momma. I will be blogging my journey to that healthier me. For now I am off to fellow blogger, Canuck, and great giveaway host Laura’s to read what everyone is cooking this week.Thanks again for the task manager Laura! With me really trying to tighten my budget with goals in mind. Here is my Menu for the week. Now I am off to here to see what is cooking for everyone else this week. I am really trying to tighten my budget when it comes to grocery shoping. So going to try and cook on the cheap, the real cheap. Why? I want to save money for our first family vacation in 10 years. So here is the menu for this week…. Now I am off to Laura’s to see what is cooking for everyone else. Today I received my campaign box from BzzAgent. In it was a box of Cakesters, as they were released on the Canadian market last month. When I opened the box Roo said “I was waiting for someone to invent these”. You see both of us love Oreos and chocolate! I was certainly a happy camper when I got to test drive this new to us snack. Roo had a friend over so they were my testers. They got a great review from the kiddos. 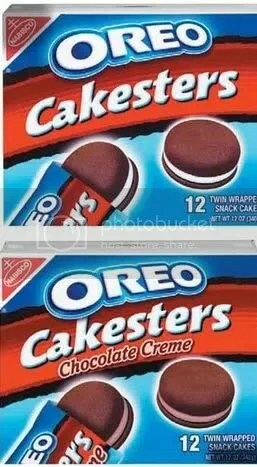 Now we all know that Oreo is known for a rich chocolate taste I find these lighter but better then another certain chocolate snack cake that has been a staple in this house. We are always looking for good snacks. Now they come wrapped with 2 in a pack. Because of how big they are I recommend eat one and share with a friend. Now they do have an allergy alert on the package so this is a NO go for school here which is unfortunate but none of the ingredients are nut related so I am going to say must be made in a factory where there is a chance of trace from machinery etc. Over all we will buy the product again. If you have tried these let me know what you think.